1 How can I access the list of my Google Groups on CGXchange? 2 What levels of user access are available? 3 How do I invite members? 4 Why can't I add external non-CGXchange addresses in my group? 5 Can I use a Google Group address to share Documents, Sites and Calendars on CGXchange? 6 What is a non-member manager? 8 How do I add members without requiring them to accept an invitation? 9 How do I remove members from the group? 10 I want my group to be very private. How do I do that? 11 Can I delete my group? 12 Can I change my group's information? 13 Can my group have more than one manager? 14 I accidentally deleted myself as manager. How do I get back my privileges? 15 Who can be a member of a group? 16 Is there a maximum limit of members a group can have? 17 What is the maximum message size on a Google Group? 18 Why are my members listed as non-verified? 19 What is a pending member? 20 How do I remove a post in my group? 21 What if I want to restrict a member from posting? 22 Can I moderate postings in my group? How can I access the list of my Google Groups on CGXchange? What levels of user access are available? The Owner is the Google Administrator, who can create the account, determine ownership, change the email address/website address, determine how a group is archived, or delete the group in addition to changing the configuration settings. A Manager is assigned by the Google Administrator and can do almost everything an owner can, including changing or adding managers. As a manager you have access to the configuration settings. You can send a message to the owner to request that emails outside of cgiar.org/cgxchange.org be added, request a change in how a group is archived, or determine whether it no longer should receive new posts, or whether it should be deleted. A Member can determine how his own mail is received – as a digest, an abridged summary, as email as soon as it is posted, or no email at all. The name associated with the email may also be changed. A member can unsubscribe at any time. Click on the Manage link located on the right-hand corner of the central pane of your group's page. The list of current members is displayed. From the left-hand menu, select Invite members. Enter the email addresses. A list of your contacts displays as you type. Alternately you can paste in email addresses from another source. Enter a short invitation message in the Write an invitation message box. 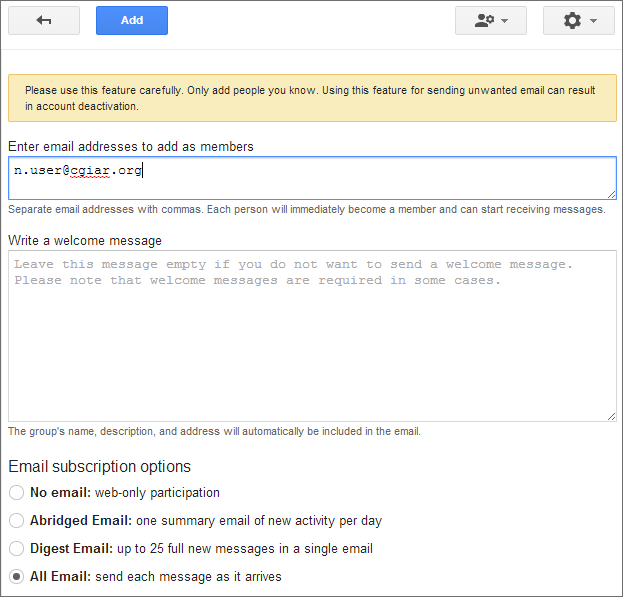 Google Groups will automatically include the group's name, description and address in the email. Click on Send Invites. Each person will receive an invitation to your group and must accept before they can receive messages. Once an invitation is accepted, each member can edit his/her membership from the group’s page. Why can't I add external non-CGXchange addresses in my group? 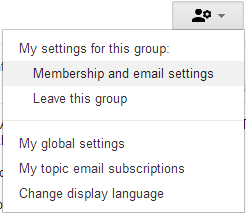 Can I use a Google Group address to share Documents, Sites and Calendars on CGXchange? Yes you can. Just make sure the member emails are all Google accounts, including non-cgiar ones, then you can use the email address of the Google Group to share Sites, Documents (folders and files) and Calendars, as a shortcut for a long list of collaborators. What is a non-member manager? 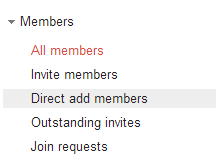 If you add members to your group by inviting them, they must accept membership before they receive messages. If you add members this way, and proceed to set one of the people you invited to be Manager before they accepted, they will be marked as a non-member manager. This is not good because the user records associated with non-member managers will require intervention from IT to receive messages or be modified in the member list. Avoid making members managers until they have accepted their member invitation. From the Use menu, select the email address you would like to use for email-based participation. Click on Save. How do I add members without requiring them to accept an invitation? 1. Go to your group’s page online and click on the Manage link located at the top right corner of the central pane. 4. Write a welcome message, if applicable. 5. Determine the default subscription option. You have the option to change this after you add members. Each person will immediately become a member and can start receiving messages according to their subscription option. Note: Please be careful if you choose Direct Add Members: make sure you are only adding people that you know. If you add many members at a time, you need to be approved by Google. Since you are inside the CGXchange domain, this usually occurs instantaneously, but a notification is still displayed. Warning: Using the Direct Add Members feature for sending unwanted email can result in your account being revoked. How do I remove members from the group? 1. Click on Manage: the list of members is displayed. I want my group to be very private. How do I do that? Go to your group’s page online and click on the Manage link located at the top right corner of the central pane. Expand the Permissions menu on the left. Select Posting Permissions. Select Owners, Managers and All members of the group in the Post menu. Yes, if you are the owner of the group. If you are a manager, please contact the owner of the group to request the deletion of the group. Can I change my group's information? Managers can only change the Group name and Description. Your Group address cannot be changed. You can also add your group’s website if you have one. To change the group’s information, click on Manage and expand the Information menu on the left. Select General information to edit the name and description. Can my group have more than one manager? Yes, your group can have more than one manager. 2. Check the box close to the name of the member/-s you wish to promote to Manager. Note: This person will have the same rights as you so be careful who you grant this membership role. I accidentally deleted myself as manager. How do I get back my privileges? If you have a co-manager, ask them to grant you the Managers role. 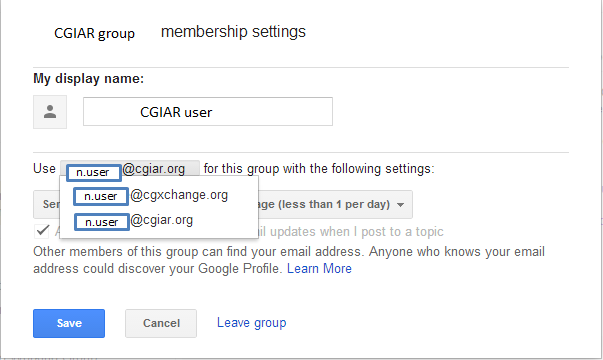 If you manage the group by yourself, contact the Google Groups administrators at cgx-support AT cgiar.org for support. You can invite anyone. A group can also be part of another group. For more information about nested groups, view the Google topic "Add a group to another group." Is there a maximum limit of members a group can have? No, there is no limit to number of members a group can have. Google has strict policies on spam and in their public groups they limit the number of addresses that can be added at a time to prevent the possibility of spam groups. They appear to relax the standard in Google Groups for Google Apps. It is possible to create a group that includes everyone in the CGXchange domain, and it is possible to add many types of addresses directly if permitted by the group manager. What is the maximum message size on a Google Group? The maximum message size is 5M and this is the default; although the group Manager can reduce this amount if desired in Manage > Settings > Email Options. Why are my members listed as non-verified? This means that either they haven't verified their accounts (New e-mail accounts) or that they have not accepted your invitation. What is a pending member? a person who has been sent an invitation but has not responded yet. a person who has requested to join your moderated-membership group. How do I remove a post in my group? Only the Manager can remove a post in a group. Expand the post and click on the pull-down menu on the right. What if I want to restrict a member from posting? 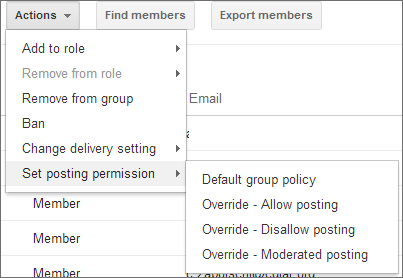 To restrict a member from posting, a Manager can change their Posting settings. 2. Check the box close to the name of the member/-s you wish to restrict from posting to the group. Can I moderate postings in my group? Yes you can. 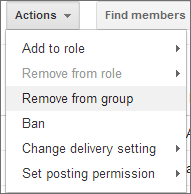 To control postings, click on Manage > Settings > Moderation and check the option for Moderate all messages to the group.